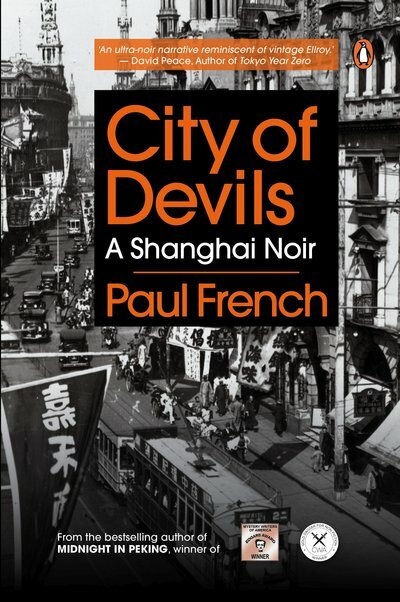 British author Paul French has lived in Shanghai for many years, and is vastly knowledgeable about Old Shanghai. Known for his in-depth research, he is also the author of The Old Shanghai A-Z , a reference book for anyone researching Shanghai history. French turning to crime solving inquiry in previous book Midnight in Peking, turned to be really interesting. Being passionate of both crime novels and Old Shanghai, I could only be interested in his new book, City of Devils, a Shanghai Noir. Just like Midnight in Peking, City of Devils is not a novel. French takes a character that attracts his interest and research it in all directions possible. City of Devils is the story two characters of the Shanghai underworld. Jack Riley was the king of the slot machines in Shanghai, while Joe Farren was running entertainment shows at the top places like the Canidrome ballroom and the Paramount. Their course in Shanghai crime met numerous times, while they became allied, fell out and got in business again. The stories of both characters is really fascinating, showing the opportunities and the lawlessness of Shanghai in that period. Little was known about the two central characters before French started his research. Information from a great many different sources have been put together, starting the local press of the time, North-China Daily News, JB Powell’s China Weekly Review and (never heard of before) blackmailing newspaper Shopping News. Although the book does not include a bibliography, they are references to many books about the period or written by people who lived through it, including Ralph Shaw’s Sin City, Bernard Wasserstein’s secret war in Shanghai, Frederic’s Wakeman The Shanghai Badlands and many more. He also search the official from the Shanghai Municipal police, and other Shanghai institutions as well as archives from foreign countries consulates that are stored in their home country. A number of well known Shanghai researchers have also contributed sometimes unpublished information that have been incorporated the book, including Prof Robert Bickers, russian researcher Katya Knyazeva and many more authors on the topic. The amount of information and the number of sources is quite extraordinary. Researching this books must have been like a real police inquiry, with attention to all possible details. Beside those larger than life characters, the most interesting part is the description of Shanghai foreign underworld including numerous people or location that are mentioned in books of the period but on which little was known. This creates a great picture of the darker side of Shanghai that mixes well with French detailed knowledge. From the known facts he create an entertaining story, by bridging the missing parts with very plausible and well informed details. 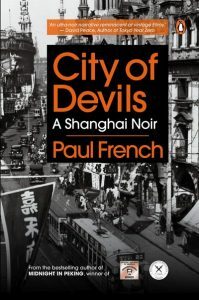 City of Devils is an entertaining read about a side of Shanghai that is lesser known. It is also a very deep research that is presented in a very entertaining way. Just discovered your blog! I was born in Shanghai at the Country Hospital. My dad worked for Jardine Matheson in a cotton mill in Yangtzepoo. My mum was a nurse and there are several references in my father’s writings to her working at the Police Hospital in Shanghai, but I can’t find any information on it or its whereabouts. Do you know if there was a Police Hospital and if so, where it was located? Mum worked in the Police Hospital in London before she went to Shanghai, so my dad may have got confused. I know she didn’t work at the Country Hospital and I’m pretty sure not at the Shanghai General. She nursed Chinese and Western patients, and her employer was the Shanghai Municipal Council. I’d appreciate any help you can give me. Thanks! I don’t recall a Police Hospital in Old Shanghai.